Jessie Makinson, At It Forever, 2016, oil and pigment on canvas, 195 x 165 cm. British artist Jessie Makinson paints exquisite multi-layered figurative compositions that drop art historical references as well as borrow patterns and motifs from other times. These flights of fancy that contain only female figures are nostalgic of the boudoir of Marie Antoinette circa 1775 with a colour palette to match the legendary cakes of the then Queen of France. 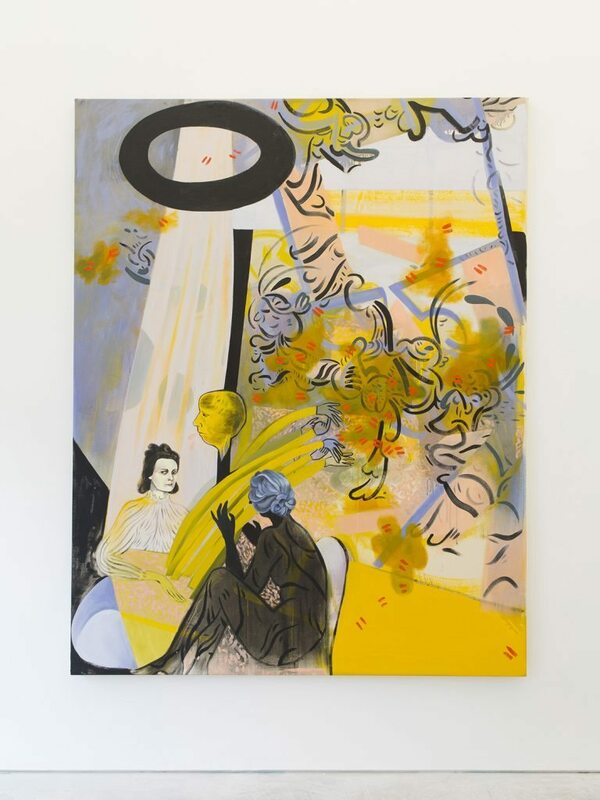 In June 2016, she was named the main prize winner of the Marmite Painting Prize V shortly after finishing the two-year Turps Painting Programme in London. Her work can currently be seen in a group show organised by Hamish Pearce and Will Rees called "Does Your Chewing Gum Lose its Flavour (on the Bedpost Overnight)?" at J Hammond Projects in north London (until 18th March). Your paintings are densely populated with aesthetic stimuli – from art historical references to fashion and interior design elements. How do you start your creative process, and how do you go about structuring these layered compositions? My practice is led by and revolves entirely around drawing. I draw at every stage of my process. I draw to think, to remember, to understand. For me, drawing is the first step in making thought physical. All the motifs, compositions and imagery originate from a kind of automatic drawing that I do. I find drawing and painting to have the ability to make sense of the information I have absorbed. When it comes to the paintings, they are not planned. I will mix up pigments and paint a large drawing all over the canvas, forming a pattern-like structure. This embeds the drawing and composition into the surface of the painting, creating a flow and relationship to the space of the surface that planning can't allow. I then look for imagery within the under drawing, referring back to my sketches, books, photos and notes. I like to work quite intuitively, allowing the narrative to be found in the act of making the painting. As each face, shape, line, colour is added, it informs the next and the narrative shifts. References to art history are also found in the painting. As I draw from and look at a lot of historical painting, I trust my experience to create associations within the work. I have always been interested in the flexibility of time within a painting, and the ease with which narratives can be non-linear. Making the paintings, I aim to find the balance between intuition and control. 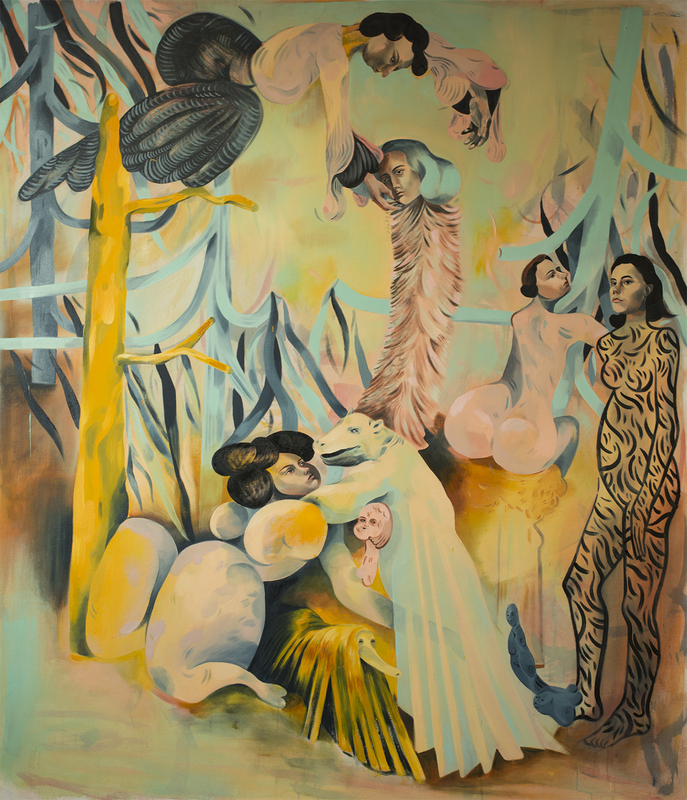 Jessie Makinson, Oh Silky, 2016, oil and pigment on canvas, 200 x 165 cm. The figurative elements in your paintings are always women, save for the occasional animal or bird. Why the fixation on the female body? The figures depicted in the paintings are usually women, but there tends to be a male presence perhaps off the canvas, as a shadow figure or an animal. I feel that an absence can often suggest something indirectly and leave room for multiple narratives. Early on when I began focusing on women, I was asked 'but where are all the men?' I found that men and women ask the question differently. I often shift back and forth, considering the women as just a means to make the painting or conversely the whole purpose. I like the idea that painting could encapsulate these two ideas simultaneously. Can something be both things or neither? I like that painting accepts that things are not black and white. 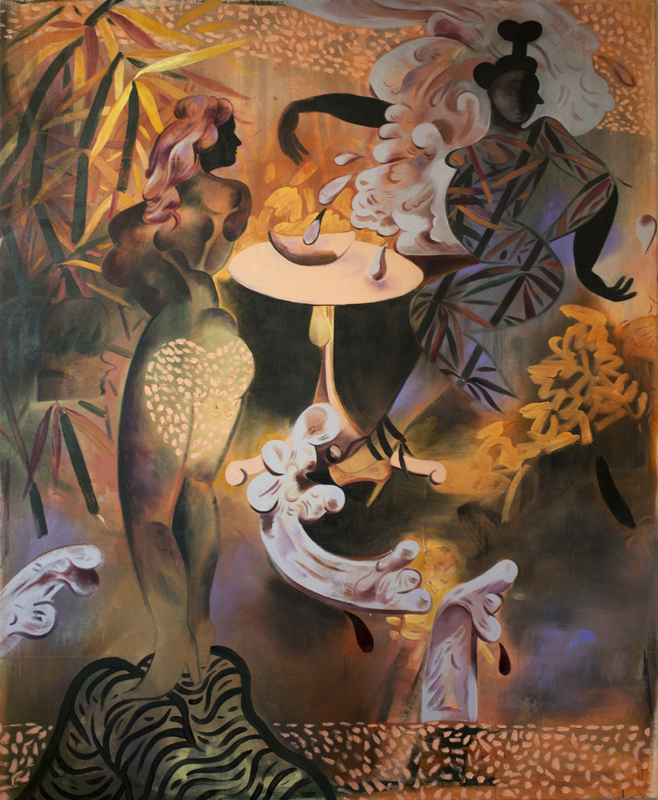 Jessie Makinson, Stirring his pot, 2016, oil and pigment on canvas, 195 x 165 cm. Colour and motif appear to be tightly bundled together in your work. What comes first? Does the motif or pattern inspire the palette or the other way around? Do you set the work in a specific historical time period which may influence the spectrum of colour? Currently, I am looking at Rococo palettes, but different series tend to be either held together by a colour palette or informed by it -- with palettes often borrowed from patterns or painting. My colours seem to simultaneously evoke both the past and the future, often referencing time periods or places, but they are obviously not the traditional palettes of those periods. They can have a very 'English' quality to them whilst also suggesting an 'otherness'. I am interested in the ability of painting to create a sense of a time or place that I have never been to -- a fictional place that is recognisable and known, but is conjured from memories of writing, film and stories. Recently, I have been looking at Japanese Shunga wood prints as I saw a reflection of my own work in the humorous, sexual, patterned images of couples in interiors. I am interested in pattern saying something about the character of a figure as well as the nature of the space within the painting. The relationship between clothes, pattern, women and interiors reflects my interest in the reciprocal nature of space. The idea of ‘space being the other half of us’ is something that has echoed through my work for many years. Are the titles of your paintings revealing in terms of creating some sort of narrative in the work? I particularly like the titles, Swamp Fox, French Girls, I Never Liked You and Get Your Own Pillow. I am a complete thief when it comes to titles. I gather them from everywhere - from conversations, books, music, anything. I recently made them impossible to read, collecting hundreds of titles from books by taking words out of context; 'Door a crack', 'Saw a strange', 'Serious crush', 'la giggles', 'King me', they start to read like a sort of poem. This is something I plan to play on a lot more in my next show. They often have double meanings, suggest narrative possibilities or are something I find funny. I see titles as an opportunity to be playful and a chance to not take the painting too seriously. Jessie Makinson, Swamp Fox, 2016, oil and pigment on canvas, 200 x 165 cm. You have had a diverse fine art educational background – from Edinburgh College of Art to The Royal Drawing School and from a three month residency in Tuscany to the two-year Turps Painting Programme in London. How do you compare the different art school approaches and which training has been the most valuable experience in terms of your current artistic practice? I had five years out before the drawing year [at the Royal Drawing School], so when I got there, I knew what I wanted to do with my work. I just had no idea how to do it. The Royal Drawing School really opened by eyes to historical painting and drawing from it. This was extremely formative for my practice as it is now. It is not as academic as it is considered to be – I still have no idea how to draw traditionally. You learn through doing. I learnt the ability to find, in the world around me, things that belong in the world of my painting. I learnt to edit the things I see, so that when I'm making an observational drawing, I am making the drawing I was always going to make. The content is not necessarily my subject matter. When I came to Turps, I didn't really know any other painters in London, and our year had so many great painters on it, so it really changed my life in that respect. Turps from the beginning felt how art school should be -- the location next to other artist studios, the tutors and the ethos. There was a huge energy to work hard, to change and to take risks. Jessie Makinson, installation view of mmmm and mmm, 2016, oil and pigment on canvas, 70 x 50 cm each. Congratulations on winning the Marmite Painting Prize V in 2016. How important has this award been in terms of exposure and opening up doors for you? Thank you. The Marmite Prize was a fantastic show to be a part of and a good reflection of the land of painting. It's hard to know how much it has helped me directly. I've met a lot of great people through it, particularly painters. You are currently undertaking a six-month residency at City and Guilds in London. Is this a time of experimentation or research for you? What do you want to achieve while there? I'm very excited about the residency as it offers a studio and access to all the workshops at the school from glass, metal, carving, ceramics and printmaking. I will still paint whilst I am there but have plans to experiment: making objects in different mediums resulting in a tactile installation that inhabits my paintings, wall drawings and the objects I have made over the residency. 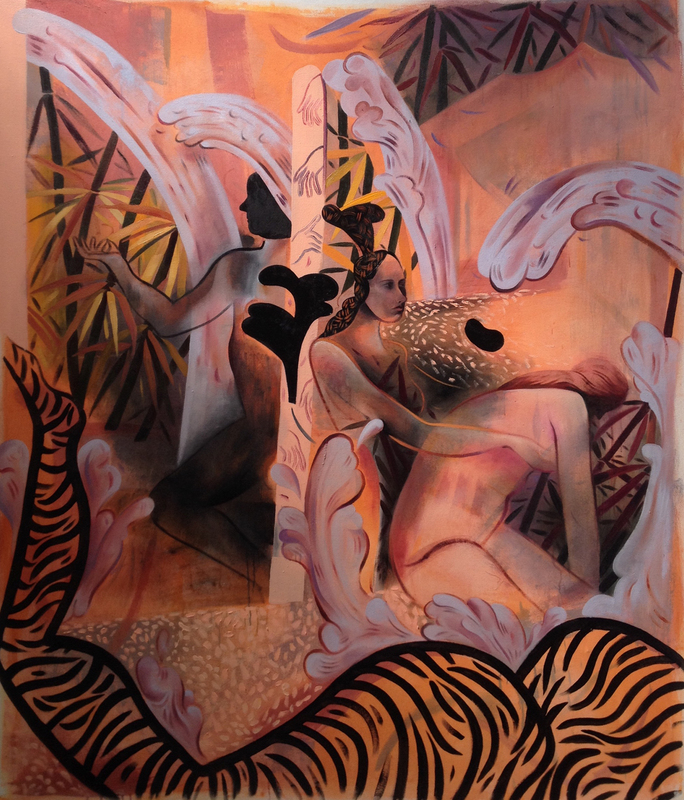 Jessie Makinson, Played, 2016, oil and pigment on canvas, 195 x 165 cm. Jessie Makinson is a British painter living and working in London. She graduated from Edinburgh College of Art in 2007 with a BA in Drawing and Painting, before attending The Drawing Year at The Royal Drawing School in 2011. In 2013, she was awarded the school’s fully-funded Moritz-Heyman Artists’ Residency in Tuscany, Italy and later received the Sir Denis Mahon Award 2014–15. Jessie finished the two-year Turps Painting Programme in London in 2016. Later that year, she was the winner of the Marmite Painting Prize V which also entailed exhibitions at Block 336, London and Highlanes Gallery, Drogheda in Northern Ireland. Her work has been shown in a number of solo and group exhibitions at notable galleries and museums including, among others, solo shows at Roman Road, London (2016), 9B Projects, London (2015) and The Princes Drawing School, London (2015) and a group show entitled Captain Lightfoot Presents... at The Glasshouse in Edinburgh, part of the 2014 Arts Festival.